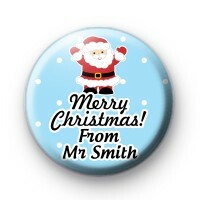 A really cute blue Christmas badge with a picture of Father Christmas and the text Merry Christmas from.... You can enter your own greeting text in the box below to create custom Christmas name badges to give out to your students. These badges are designed for teachers to give out in school over Christmas but can be also used to hand out to colleagues or friends. Simply enter the text you would like on the badge in the box below before adding to your basket. Custom Christmas name badge handmade in our UK workshop. We have a great range of Christmas badges in our Xmas badge category, from Father Christmas (Santa) badges to reindeer and Christmas jumper badges. Standard 25mm button badge made in the UK.